I thought about the "Lost" topic a bit and pretty much settled on drawing a room with my glasses hidden in it somewhere, but didn't get time. So here's an old "Lost" picture. Anyone who has read the archives here will have already seen this picture and know the sorry saga of Percy, our wonderful talking cockatiel who flew off early last year. This picture (in black and white, he's really the usual colours) was for a "Lost" flyer we put in letterboxes. After tracing some 30-40 found cockatiels, we eventually located exactly where he had gone (on the same day he was lost) due to several neighbours of the finders. Unfortunately, that didn't help us get him back... maybe someday I'll do a comic about it! I still can't convince myself that clipping birds is a good idea - it definitely makes them unfit and unhealthy, but maybe as an occasional thing it's okay. And I'm also never going to be keen on keeping pets in cages (apart from to sleep), so that's not a solution either. Percy was quite a character. Parrots are at the top end of intelligent bird families, with cockatoos among the brightest, so it shouldn't be a surprise that cockatiels can be brainy, though I've come to realize that, even for a cockatiel, Percy was exceptionally smart. I was amazed at the amount of tunes and phrases he could recall, how much he could be trained and his general sociability with all people and animals. He did haul off and attack me occasionally (which is due to hormones once males reach a certain age) so caution can be needed with cockatiels at times, particularly with children, though good training will always help. wow! Poor Percy-or maybe poor you. Nice drawing though! Sounds like an exceptional pet - thanks for sharing his story, and the really nice drawing too! Carla, I can see how your mother was beguiled by her cockatiel. The trouble is that once they get lift under their wings they just go up and up and have no idea how to come down! Percy did get out once when I was home, landed in the carport and surveyed the world beyond. I called him and he flew back to me! When he did get out again it was by sneakily hitching a ride at the last minute. Anonymous, thanks for checking out the archives! Jewels, I can't connect to you Blog - it's blocked, possibly by a privacy option - but thanks for writing! Maybe this would be a good time to post your 20 random things....this originally started with Carla! 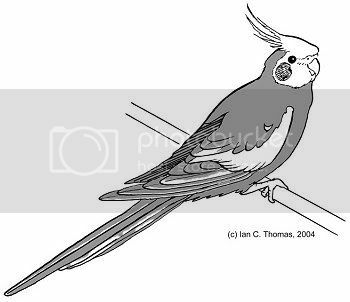 The cockatoo (or -tiel?) next door shrieks and walks sideways along the spouting at the edge of their roof. Obviously he does it that way because that's the only way his feet can grasp the outer edge. It's totally hilarious, seeing a cocky walking sideways around the perimeter of someone's roof while shrieking. The last few days we've had an evidently domesticated cockatoo (with a ring on one foot) coming to visit, on his own, when all the other cockatoos aren't around. He always seems hungry. I left the details with the vet, but I don't want to catch him unless his owner shows up. Liam Runs Late - Sorted! Are You Going to Buy That? Moth & Tanuki in colour!